The word “impact” is small yet powerful. Defined as “a strong effect or influence on someone or something”, positive impact is a factor in shaping the wellbeing of a community. Community Foundation Grey Bruce takes seriously its responsibility of effective impact in Grey and Bruce Counties. The Foundation strives to help create healthier and supportive communities through endowment building, philanthropic partnerships, granting, and community leadership. See what impact the Foundation has in your community! 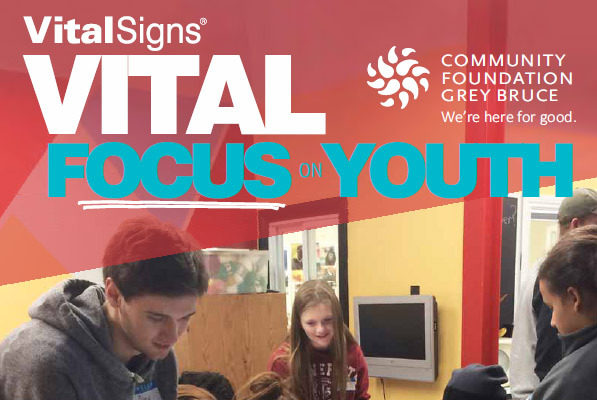 Community Foundation Grey Bruce organized a Vital Focus on Youth Event on April 12th, 2019. The day consisted of a personal branding workshop courtesy of RBC Future Launch, a presentation by thought leader Erin Bury, and a panel discussion with local entrepreneures. The Collingwood Collegiate Institute's Entrepreneurship class joined us at the Vital Focus on Youth event and one of the students provided great feedback on the day of events! "Collingwood Collegiate Institute’s grade 11 Entrepreneurship class was given the opportunity to attend the RBC Future Launch Vital Focus on Youth event on April 12 in Owen Sound. This was a fantastic opportunity for our class and we all learned a great deal of valuable skills and information that we can apply to both our class and future business ventures. Over the course of the afternoon, our class participated in a personal brand workshop, talks from influential members of the entrepreneurial community and a presentation by Erin Bury. The knowledge we gained from the personal branding workshop put on by RBC Future Launch taught us all a lot about the importance of presenting ourselves well, managing our social media profiles in a professional manner, what a successful elevator pitch looks like, and much more, all of which we will be able to implement into our lives as we integrate into the working world. After hearing all of the influencers talk about their involvement in the initiative, as well as how they hope it will benefit the community, it was very clear that everyone involved in this event was keen on seeing youth – the future of our world – succeed and we are very grateful for the opportunity to have worked with them at this fantastic event! Lastly, Erin Bury gave a fantastic talk about building your business, resilience, the key attributes of an entrepreneur and much more! It was fantastic to learn about some of the steps we can take to become successful entrepreneurs, and I know that it will be beneficial and valuable to all of us as we make our way through the world. Thank you for giving us this fantastic opportunity; we all really appreciate being involved in such a constructive and important project. Ms Thomson and CCI’s Entrepeneurship class"
Thanks for the wonderful feedback from the Collingwood Collegiate Institute's Entrepeneurship class!